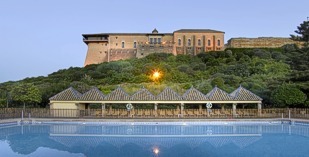 The Parador of Carmona is a triumph in the restoration of an old building for its modern use. It combines the old Arabic buildings with new construction necessary to give modern luxury. The Parador Carmona has the Moorish style patio, wonderful halls with decorated ceilings, balconies overlooking the river below and many other treats to behold. The decor makes full use of wood and leather furniture on rugs and in rooms decorated with colourful drapes, swords and the other decorations. The castle was enlarged by King Pedro whom it appears had an eye for the ladies - and the wealth and title to achieve his desires. Although history records that he was unsuccessful in his pursuit of his fathers mistress Leonor, the mother of his step brother and successor, Enrique. During his frequent absences from the castle, he used to put his wife in the care of the nuns at Palencia. One of the nuns, Sister Maria Colonel, was very beautiful and the king was attracted to her. To make herself unattractive to him she disfigured her face with burning oil. Her remains are still preserved in the Convent of Santa Ines in Seville. The fortress was built when the Moors from North Africa held the area. The construction was on the site of earlier fortresses of the early Iberian people and the Carthaginians. Carmona is one of Spain's National Monument Cities and has been visited by many famous rulers of the past including Julius Caesar and Muza the Arabic invader. Julius Caesar was particularly impressed comparing the city to the beauty of the morning star. When staying at the Carmona Parador, time must be found to walk around the city and look at the palaces, mansions, convents and churches. This may be difficult when there is so much in the Parador itself. Of particular note is the Bermejo room, with its rugs and numerous antiques. 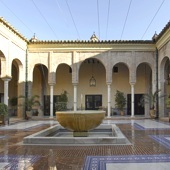 The courtyard has a colonnaded cloister and a Mudejar fountain. Around the fountain is: "Oh sweet and cleansing water, crystal clear as the source of this fountain, the architect has placed you here in order to erase from memory blood shed in the most cruel of wars between princes, sons of the same king"
"Pechuga de pollo a la parrilla" roast chicken with vegetables and french fried potatoes. The restaurant also has a gluten free menu. The local "fiestas" in Iberia are well worth visiting. In Carmona the main feast is Nuestra Senora de Gracia which is held on 8th. September. In May the Carmona Fair is held and the Easter celebrations are well worth visiting. On a modern note, the unheated seasonal swimming pool, 30 metres below the Parador, is stunning. This Parador has fifty one twin bedded rooms, nine double bedded rooms, and three single rooms all having private bathrooms. In the rooms you will find a telephone, television, TV canal plus, safe and mini bar. The Parador has air conditioning, central heating, currency exchange, lift, parking (without security and limited places), satellite television, gift shop, garden and seasonal swimming pool, restaurant, bar and conference facilities. Distance from the nearest airport is approximately 25 kms, train station is 30 kms away and the nearest port is 30 kms away. The views of the valley from this magical place are breathtaking. Because of our flights we weren't able to arrive until just after the bar closed, which was shortly after midnight and our stay was only for one night. For this reason we can't comment on the restaurant. Our room was spacious with amazing views. Breakfast was excellent and as the pool didn't open until 11.30 am we only managed half an hour in the pool before we had to, very reluctantly, check out. We then left the car and wandered down the cobbled streets into the the town to enjoy a drink before making our way to Cadiz. I would hate to think that we will never go back and spend more time here. Staying at this Parador was the highlight of our trip (& we visited some amazing places while in Spain!). The building itself is beautiful ... our room was spacious with a fabulous view. The breakfast was the best we had during our entire 2 weeks in Spain. The staff were very helpful and exceptionally friendly. We LOVED staying here & definitely see a return visit in the future! A beautiful place to stay! This is a very atmospheric Parador. A magnificent castle that will put you back in the middle ages. We stayed for one night in Carmona, which is a great town to explore. And this is surely the most historic hotel in town. The only setback was that the rooms were quite small and standard. The view however is great and so are the common area's. It was to cold to go into the pool, but it is surely a great place to relax in the summer. Breakfast was very nice as well. In planning our drive from Cordoba to Sevilla, we decided to take the opportunity to stay at the Parador Carmona. Our friends had done so years past and still had the fond memory of their stay. Our arrival was interesting winding up the historic streets to the Parador. Reception was cordial and our room was perfect. The view over the valley and distant country side was beautiful. We wonderered duirng the day through the quaint village and later found ourself in the Parador dining room for a well presented dinner and execellant service. In the morning, we enoyed the buffet breakfast and left for Seville content that we took the time to enjoy this historic residence. 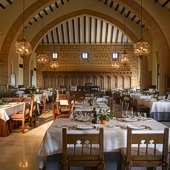 Luxury Parador hotel in a fourteenth century Arabic fortress in Carmona, Seville, Spain.